The Committee of Ministers' Deputies of the Council of Europe held its 1223rd meeting on the 18th of March 2015. Within the frames of the agenda item "the Council of Europe and the Conflict in Georgia", the Permanent Representative of Georgia to the Council of Europe Mr. Konstantin Korkelia made a statement regarding the announced signature of so called ''treaty on alliance and integration'' between the Russian Federation and the proxy regime of the occupied Tskhinvali Region. 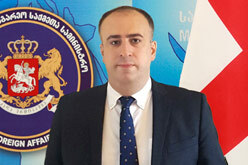 The Permanent Representative of Georgia assessed the fact as yet another action by the Russian Federation directed against sovereignty and territorial integrity of Georgia and emphasized that despite international concerns Russian Federation carries on with the process of annexation of Georgian territories. The Permanent Representative of Georgia called on the Council of Europe member states to properly assess this fact, both politically and legally and to devise an effective response to confront the annexation of the occupied territories of Georgia by Russian Federation. Within the frames of the agenda item the Representative of the European Union made the statement on behalf of the European Union on the announced signature of so called “treaty”. The Representative of the European Union underlined that the signature of the so called “treaty” violates international commitments taken by the Russian Federation and is a step against security and stability in the region. The European Union reiterated its firm support for the sovereignty and territorial integrity of Georgia. Albania, Bosnia and Herzegovina, Georgia, Montenegro, Republic of Moldova, Norway, The Former Yugoslav Republic of Macedonia, Turkey and Ukraine aligned themselves with this statement.